We have different bitcoin affiliate programs for all types of users - end users, web developers, website owners etc. Please select the affiliate program most suitable for you below. All affiliate programs provide the same amount of affiliate commissions: 0.50% for each transaction. How it Works: Our own commission is 1.5% from customers for all customer payment transactions and this 0.50% (33.3% of the 1.5% total payment amount) will be paid through an affiliate program to you. I.e. it does not affect your end customers and these affiliate fees are paid from our own commission. (or Add Bitcoin Gateway to Other open source plugins/shopping carts, etc) and share it. GoUrl will automatically track all purchases on various websites with any GoUrl affiliate key and it will automatically send 0.50% from customer payment to affiliate user. It is easy! How to earn 1,000$ per month: For example, users use your free or paid plugins / scripts / software with integrated gourl bitcoin gateway on their own websites and receive a total of $200,000 (in bitcoins) per month; You will automatically receive an affiliate commission - $1,000 in BTC, per month, from us (0.5% from total payments). Transparent statistics. I.e. you can easily earn thousands of dollars if your script / plugin is popular (or you can add our gateway to other popular shopping carts as an addon with your gourl affiliate key)! Our payment server automatically tracks all affiliate keys and will automatically send you 0.50% from all bitcoin/altcoin payments which will be made through your script with your affiliate key. (your script/s can be used on many websites and you will automatically receive affiliate revenue from each crypto payment received by all those sites). You can run an Affiliate Program on your website and offer a lifetime affiliate commission 0.50% from the total amount of payments to affiliate user if customer/buyer or seller was referred by them to your website. We are ready to pay that affiliate commissions to your users ourselves. This will make your website much more attractive and help to advertise your website on the internet. 2. Affiliates for Web Developers GoUrl Bitcoin/Altcoin Payment Gateway is an open source crypto payment system. You are free to modify, sell it and add new functionality - create new scripts, software, plugins/add-ons for Websites with GoUrl Bitcoin/Altcoin Payment Gateway. 3. Affiliates for WooCommerce If you are a webmaster and install GoUrl payment gateway on any website - you can install our ready-to-use GoUrl Bitcoin Gateway for WooCommerce, add your affiliate key (file gourl-woocommerce.php, line 1117, replace $affiliate_key = GOURLWC_AFFILIATE_KEY; TO $affiliate_key = "...your_gourl_affiliate_key...";) and get lifetime commissions from us. We respect your work in the integration cryptocoin secure payments (WooCommerce with Bitcoin/Altcoin payments). 4. Affiliates for Wordpress Theme Developers Bitcoin/Altcoin Promotion Program for Wordpress Theme Developers - add support GoUrl Bitcoin Payment Gateway for Woocommerce in your wordpress theme by default. 5. Affiliates for Wordpress Plugin Developers You can easily integrate Bitcoin payments to your own wordpress plugin using our official wordpress plugin bitcoin gateway (for example, if you have "membership plugin" - you can offer premium membership for bitcoin/altcoin using our wordpress bitcoin gateway). 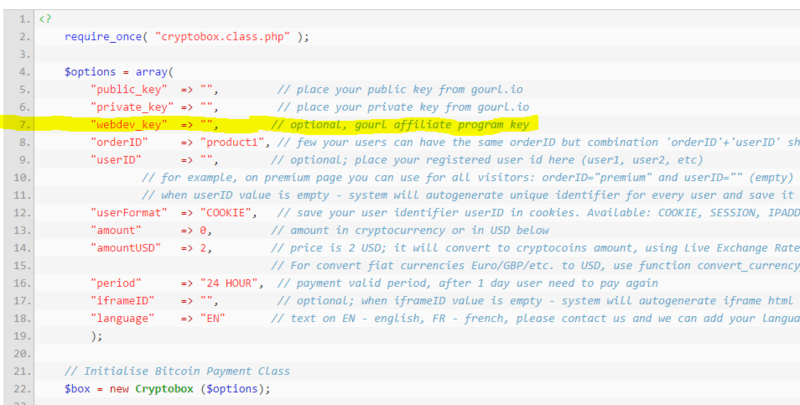 You need to add a few lines of code to your plugin (gourl bitcoin payment gateway with Affiliate Program for you - 33.3% lifetime revenue share ) and bitcoin/altcoin payments will be automatically used in your plugin. 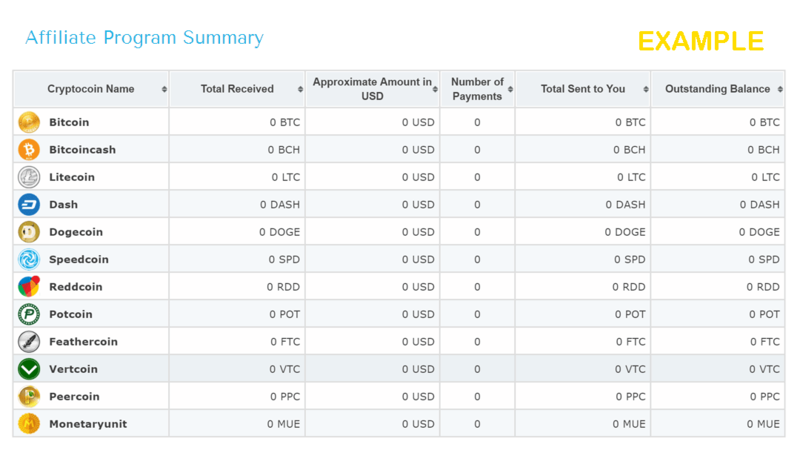 We offer Free Support in the integration of our GoUrl Crypto Payment Gateway in your scripts/plugins/themes/website.